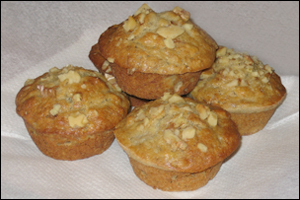 How is it possible that, until today, we did NOT have a recipe for guilt-free banana-nut muffins? We're remedying that right here and now with one of our best-ever muffin recipes! In a large bowl, combine both types of flour, baking powder, cinnamon, baking soda, and salt. Evenly distribute batter among the cups of the muffin pan, and smooth out the surfaces. Top with chopped walnuts. HG Alternative: If made with an equal amount of Splenda No Calorie Sweetener (granulated) in place of the granulated white sugar, each muffin will have 143 calories, 26g carbs, and 7.5g sugars (PointsPlus® value 4*; SmartPoints® value 4*). We're not quite sure why regular banana-nut muffins get it so wrong. Bananas are sweet to begin with, so you don't need to add too much sugar to the equation. And they make baked goods nice and moist, meaning it's not necessary to include large amounts of butter or oil. But most banana muffin recipes do both of these things anyway. Plus, if you're going to make muffins with good-for-you fruit, wouldn't it make sense to keep on that healthy path and use flour with a little fiber? Another fail for standard banana muffins! What they DO generally have is an abundance of nuts -- and while we love that walnuts have healthy fats, there's no reason to go overboard. A final flaw? Absurdly large serving sizes. 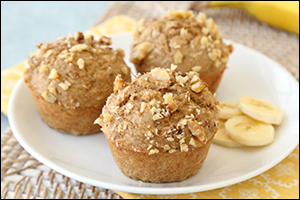 We love big portions, but not when they carry crazy calorie and fat counts -- supersized banana-nut muffins contain around 600 calories and 35+ grams of fat! Our muffins aren't like those other muffins. Our muffins get it right! Time to share! Click "Send to a Friend" to pass along this superb new recipe.